Winco WDM009-202 Ardesia Linza White Melamine Square Mini Bowl 3-1/2"
TigerChef > Dinnerware > Melamine Dinnerware > Melamine Serveware > Melamine Bowls >< Square Bowls > Winco WDM009-202 Ardesia Linza White Melamine Square Mini Bowl 3-1/2"
✔ 5 oz. 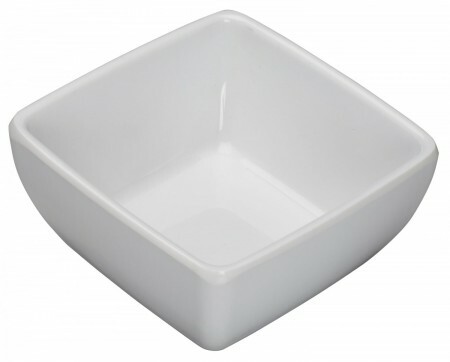 capacity✔ Color: white✔ Break-resistant, highly durable✔ Dimensions: 3 1/2"
Serve side dishes like guacamole, wasabi, and other condiments in the Winco WDM009-202 Ardesia Linza White Melamine Square Mini Bowl 3-1/2". A versatile addition to any food service venue, this bowl is also perfect for serving petite-sized appetizers or desserts. Boasting a smooth surface with a pristine white finish, this item easily complements any dinnerware collection. Thanks to its high quality melamine construction, this exceptionally durable mini bowl boasts a ceramic look without being vulnerable to breakage.